Today was a garage day full of swearing and pain and some success. 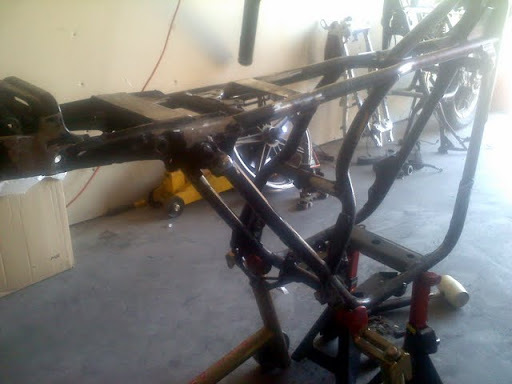 Started the morning by taking apart my top tripple in my hoopty set up. 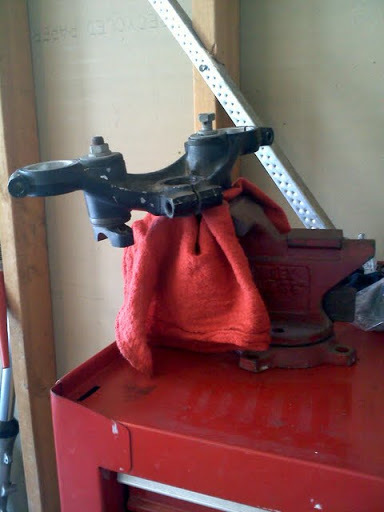 Would have been easier if the vice was attached to anything. 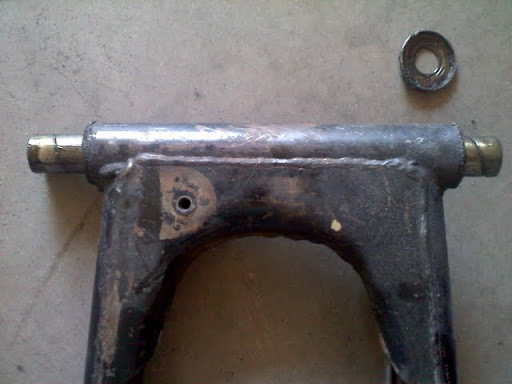 Then I pulled the swingarm to check the bushings. Stock ones are plastic, so people usually replace them with either steel or bronze. Mine still has the plastic bushings. Of course I got a little over-excited about taking something apart (yay disassembly or destruction! ), and I forgot to check the swingarm play before I took it off. Der. 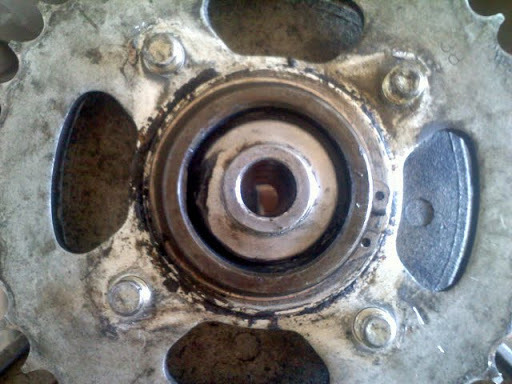 So, guess I’ll put it back on (hell, it’s only three nuts) and check. Then I’ll take it back off and paint it. I wanted to take the wheels in to get sand blasted, but first I had to get the rotor and sprocket off the rear wheel and the tires off. I needed leverage cuz the damn thing kept rolling around! So, I set it on a box and wedged it between the wall and some shelving. There are little tabs that hold the nuts in place. Since I have no chisel… I had to make do. 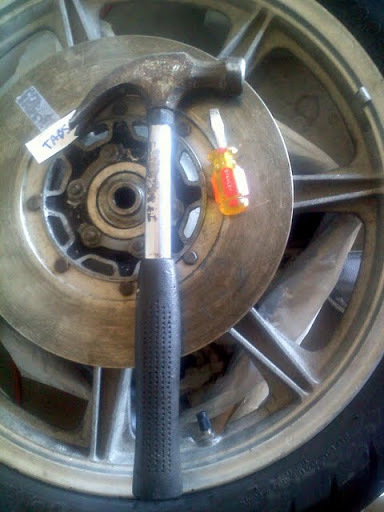 Each time I hit the screwdriver, I thought, “please don’t shatter the handle!” It worked great! I got the rotor off with only a little swearing. 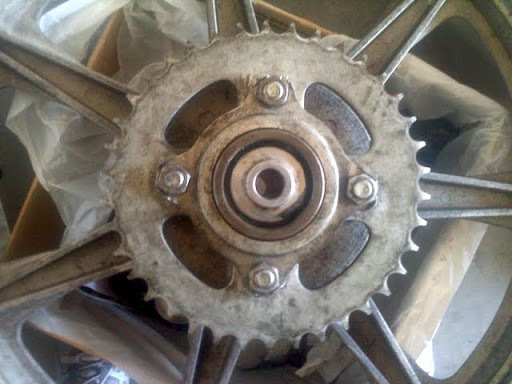 The sprocket proved to be a little more stubborn. I got the nuts off with only minor injury to my pinky finger from it crashing into the sprocket after a particularly stubborn nut decided to loosen abruptly. I probably should put some ice on it. It’s still kinda swollen. However, there is a pesky and rather large circlip holding the damn thing on. I also have no circlip pliers and my round-about efforts were in vain. Luckily, the fine folks at Apache Motorcycle Scottsdale (7340 East McDowell Road) got the circlip and sprocket off for me when they took my tires off. 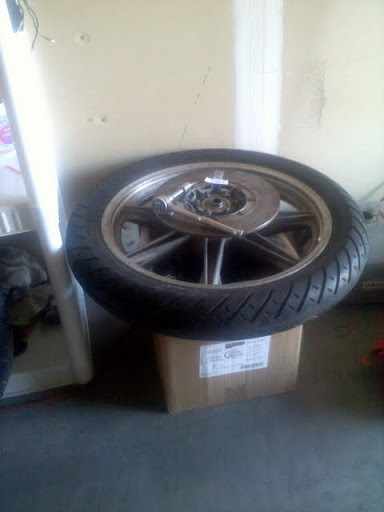 Once that was completed, I dropped them off at the Arizona Powdercoaters to get sandblasted. Whoohoo!